The American Prize is honored to announce the winner and runners-up in the community division of The American Prize in Wind Ensemble/Concert Band Performance, 2014. Congratulations! The Southern Tier Concert Band, formed in 1994, consists of professional and avocational local musicians. Mr. Robin Linaberry, the lead conductor, is assisted by associate conductors Mr. Barry Peters, Mr. Art Carichner and Mrs. Robin DeSantis. We have two goals - to enable accomplished adult musicians to perform band compositions in an exceptional ensemble and to provide a positive example for music students. The STCB performs primarily in local schools in a collaborative “Banding Together” format. Each concert sees the STCB performing several pieces on its own, followed by the performance of several pieces by a joined ensemble of school and STCB musicians. In addition to performing challenging music in a risk-free context, the students get to experience the full sound of a complete ensemble, they get to work with accomplished musicians in a performance and they get to see how adults keep music performance in their lives. Among judges' comments: "dexterity and brilliance...and the adventuresome presentation of new and challenging works..."
Established in 1975, the Hot Springs Concert Band has grown from twenty local residents into an 80-member band – the largest community band in Arkansas – and the only one rehearsing and/or performing year round. Its members come from seventeen communities in Central Arkansas, some driving 70 miles each way to rehearsals and performances. The HSCB performs four indoor and eight outdoor concerts annually; audience sizes range from 650 (indoor and formal) to 1,500 (outdoor and informal in Hot Springs National Park) for these concerts. Each 90-minute concert has a theme, and the music is selected accordingly. The HSCB earned the coveted Hot Springs’ “Tourism Organization of the Year” award. Among judges' comments: "...polished and tight in sound and presentation of their works..."
The Los Alamos Community Winds is a wind ensemble made up of members of the Los Alamos, NM community. We comprise both amateur and professional musicians of all ages and backgrounds from middle and high school students to retirees in our area. The first performances of a concert band in Los Alamos were noted in newsletters from 1946. Activities over the years have included many weekly summer concerts as well as performing at various civic functions such as the 4th of July fireworks celebrations. 1. 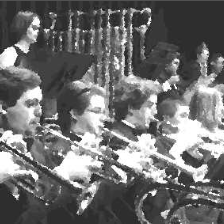 To provide the Los Alamos community with a quality performing ensemble specializing in the best literature for the concert band and wind ensemble. 2. To promote public awareness of the importance of music. 3. To instill and sustain the American heritage of concert band music. 4. To provide student musicians with a good representation and model of ensemble performance. Among judges' comments: "...brilliance in programming serious works alongside lighter fare and allowing such musical juxtaposition to keep the audience's ears alert and entertained at all times..."